One of the most remarkable sportsmen in cycling history came not from what we typically consider the heartlands of cycling—France, Belgium, Italy—and did not make his mark on the track or in famous stage races or as a manufacturer. In an age of hard men, Sir Hubert Opperman became a symbol of Australian sporting glory as he pedalled into the record books in the 1920s and 1930s through a series of endurance rides so demanding it hurts to even read about them. 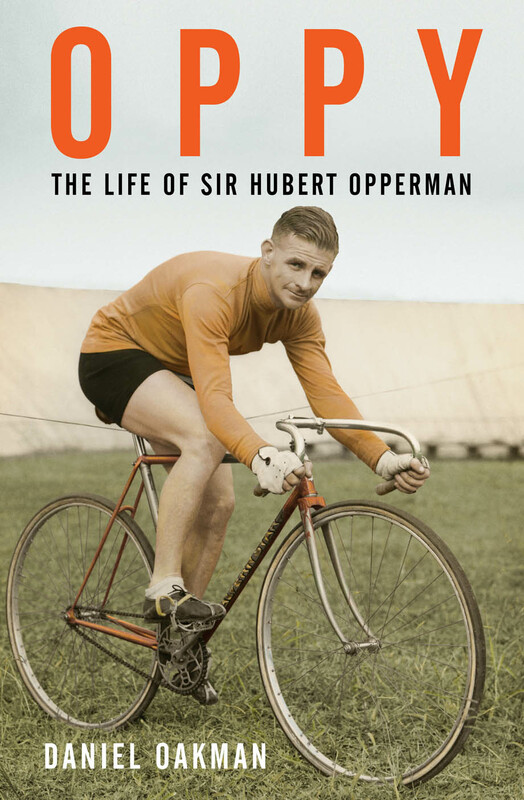 “Oppy,” as he was universally known, is the subject of a new book by Daniel Oakman about the very full life of a public figure, both as an athlete and a politician. Born in the State of Victoria in 1904, Hubert Opperman was the grandson of German immigrants to Australia. Not a terrific student, he joined the Post Office in the expectation of a secure job. Already a keen cyclist, he became a messenger, putting in long hours on a heavy delivery bicycle. Attracted to the local racing community, he participated in his first competition at 17, placing third. He soon attracted that attention of a local bike shop owner, Bruce Small, who signed up the youngster to represent his Malvern Star line and the post office's loss was professional cycling's gain. Opperman soon made his presence felt in the long-distance races prevalent in Australia. One of the virtues of the book is that it so well describes a sporting environment quite different from what was happening in Europe or the United States at the time. Australia boasted the Warrnambool to Melbourne Race, a one-day classic event founded in 1895 and still run, making it the second-oldest race after Liège-Bastogne-Liège, and a number of shorter events. There was some track racing as well but nothing resembling modern stage races, or even contemporary ones. The Australian racing scene in the 1920s was a technological and administrative backwater. Riders were at the mercy of governing bodies dominate by men who had grown up riding around the turn of the century and who stubbornly resisted the rapid technical advances in bicycle design in the first decades of the twentieth century. Riders were forbidden from using brakes—which were deemed too dangerous and encouraged inconsistent riding—and instead had to rely on back-pedalling or grabbing the top bar and pressing their forearms against their spinning legs. It was soon apparent that Oppy was a special rider. In addition to his physiological advantages (although not a large man), he possessed the mental attributes suited most to endurance riding on the truly terrible roads of his country. He participated in track motor-paced events and the limited road races available to him, winning pretty much everything important within five years of beginning his racing career and remains the only rider to win four Australian national championships, but he really made his mark in solo long-distance rides. Accompanied by support vehicles and the omnipresent Bruce Small, he set numerous Australian and world records for distance. His modest personality and sportsmanlike demeanour made him into a public darling. Thousands would turn out on the streets watch Oppy ride by on his long quests. Australia had never seen anything like it. Proud of Australian cycling, a newspaper opened a public subscription to send Australia's best to compete with the world's best at the 1928 Tour de France. 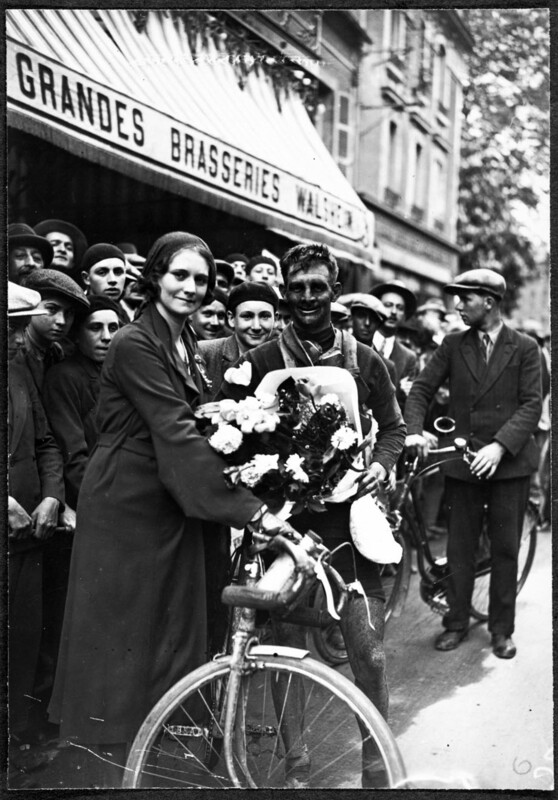 Although not the first Australians to compete in the race, with a duo present already in 1914, the three Australians (and one New Zealander) who came to France with Oppy as the team captain aroused enormous public interest in France. Unlike the Australian press, which floated wildly unrealistic opinions as to the probable success of the home team, the French sporting press, while charmed by the Australasians, figured that they would be finished after three stages. The account of the 1928 Rovat-Wonder-Dunlop team, which was the embodiment of Murphy's Law, is a highlight of the book. The Aussies quickly discovered that their previous experience had not really prepared them for the brutality that was the Tour de France. The mountain stages were particularly hard and Opperman, who easily outclassed his teammates, discovered his near-complete lack of descending skills. During one stage, the four riders crashed a total of 19 times. But somehow, in the end, Oppy managed to finish a commendable 18th and two of his teammates got to Paris as well. 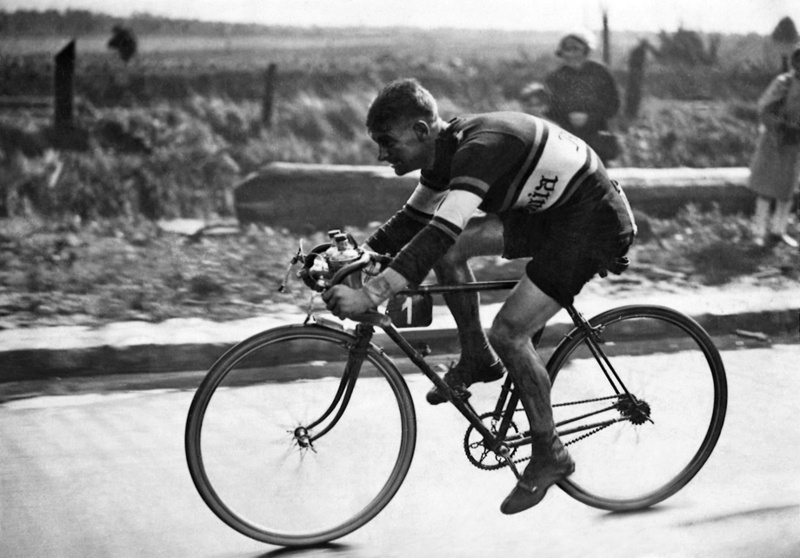 It was not a race that they could have won as the flat stages were designed as team time trials—a bizarre experiment by Tour founder Henri Desgrange—and with only four riders Rovat-Wonder-Dunlop had not chance against the much larger teams. Even stranger, at the halfway point of the Tour, teams could bring in new domestiques to replace ones that had already quit! Although he did not win a stage, Hubert Opperman became a massive celebrity in France due to his determination, magnified soon after the Tour by his winning of the Bol d'Or 24 hour paced track race. He loved the country and returned in 1931 for the Tour, where his combined Australian/Swiss team did slighly better than before. Oppy, who had learned to descend, came 12th, and a teammate, Richard “Fatty” Lamb, won the red intermediate sprints jersey (while losing an amazing 12 kilos of weight!). But the real reason that Oppy was at the Tour was to train for the upcoming Paris-Brest-Paris race that year. P-B-P, which basically required the cyclists to be in the saddle for two full days, continues to be run as an amateur event every four years. 1200 kms in length, it suited Opperman ideally. The account of his preparation and the race itself is a gripping tale and it hard to imagine that at the end of a race this long the exhausted riders, five at the front including stars from the Tour, managed a sprint finish at the velodrome in Paris. It was probably Opperman's greatest triumph and added still more to his reputation in France. 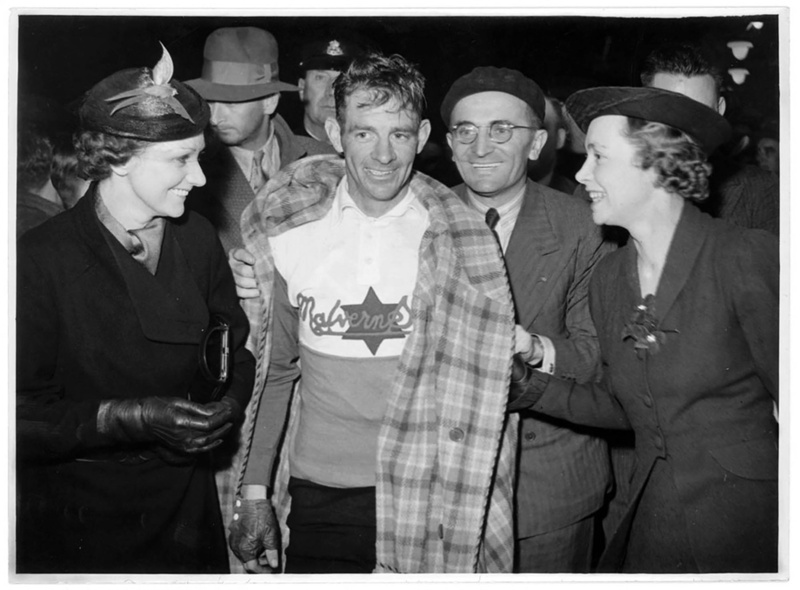 On his return to Australia, he objected to the handicap racing system for road races that actually was to continue for decades and instead concentrated on distance records. In Britain, long-distance record-setting was popular as road racing was essentially non-existant so he turned his sights there. He set a whole series of new records, including one on the famous End-to-End route from Land's End to John o'Groats, which may be even harder the Paris-Brest-Paris although roughly the same distance. He subsequently returned with two countrymen to smash a whole series of British records, on single bikes and tandems, raising Australia's cycling reputation to the skies in the UK and humiliating the locals. His riding career came to an end soon before the start of World War II and the book then proceeds to describe the interesting Second Act of Oppy's life. This account is unique: most biographies of cycling stars peter off here as, once out of the limelight, they are not very interesting anymore. Enlisting in the Royal Australian Air Force, Oppy showed a skill for management and, with war's end, he continued his business relationship with Bruce Small and the Malvern Star firm. But things took a very different turn in 1949 when he was asked to run for office for the Liberal Party (in Australia this is actually a right-centre party, in spite of the name) and successfully defeated a Cabinet Minister. Opperman had given many presentations during his cycling career about his endurance rides—even appearing as a theatrical act—and had become a very good public speaker. His political career ran for 17 years and saw him gain the increasing confidence of the Prime Minister of the day, Robert Menzies, who named Opperman first Deputy Whip, then Chief Whip, and then, in 1960, Minister of Transport. He was named Minister of Immigration in 1966, a post he continued in for a year under Menzies' successor. The immigration portfolio was something of a poisoned chalice and Opperman found it stressful and damaging to his reputation. Leaving government, he was knighted for his services to Australian politics—unlike today's cycling knights such as Bradley Wiggins, Chris Hoy and David Brailsford, who were honoured for cycling success. Opperman's final role in public service was as the Australian High Commissioner to Malta, something of a backwater assignment. He retired in 1972 and continued to ride a bicycle until he was 90, regaining some of the form lost during the years of politics and diplomatic hospitality. He passed away in 1996 aged 91, dying of a heart attack while riding his home trainer. The Sir Hubert Opperman Medal is given to the best Australian cyclist each year, with Rohan Dennis, the 2015 winner, taking it again on November 23 this year as Men's World Time Trial Champion.